To Cite: Choi S J, Ha E , Jhang W K , Park S J. Clinical Utility of B-Type Natriuretic Peptide on Pediatric Intensive Care Unit Admission in Predicting Mechanical Ventilatory/Circulatory Support for Heart Failure, Iran J Pediatr. 2018 ; 28(6):e68162. doi: 10.5812/ijp.68162. Background: Increased B-type natriuretic peptide (BNP) level is known as a predictive value for cardiac dysfunction in intensive care unit (ICU) patients. Objectives: To verify the association between BNP on admission and clinical outcomes including need for mechanical ventilatory/circulatory support and mortality in patients with heart failure (HF) in pediatric intensive care unit (PICU). Methods: Medical records of 132 HF patients admitted to PICU between February 2009 and August 2015 were reviewed for demographic, clinical, and laboratory data. Results: Among 113 patients who were finally included, mechanical ventilation (MV) and extracorporeal membrane oxygenation (ECMO) were used in 64 (56.6%) and 19 (16.8%) patients, respectively. Parameters associated with MV were high pediatric risk of mortality (PRISM) III score; highest vasoactive-inotropic score within 24 h of admission; elevated lactic acid, BNP, CK-MB, and troponin I levels. 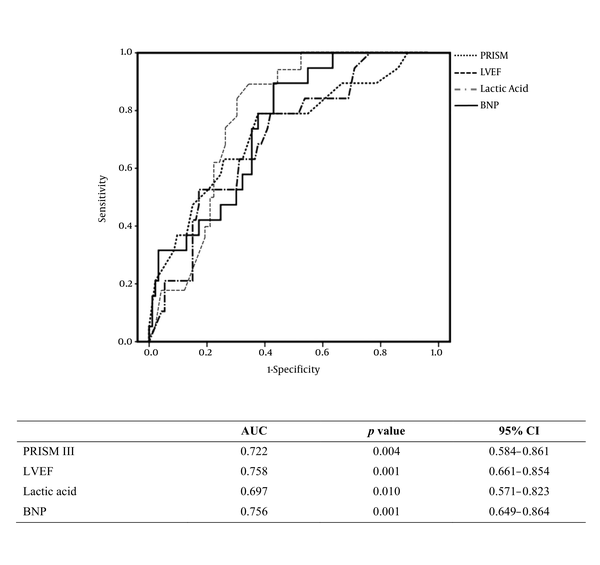 Parameters associated with ECMO were high PRISM III score, reduced left ventricular ejection fraction (LVEF), and elevated lactic acid and BNP levels. Only high PRISM III score and BNP were associated with mortality. The sensitivity and specificity of BNP with a cutoff value of 1848 pg/mL were 75.4% and 72.7% for MV and 89.5% and 50.0% for ECMO. Conclusions: In ICU settings, BNP levels on admission may be useful biomarkers during critical decision making including the determination of mechanical ventilatory/circulatory support. B-type natriuretic peptide (BNP) is a neurohormone secreted in response to increased volume and pressure in cardiac ventricles (1, 2). BNP was shown to increase well above 100 pg/mL in cases of acute or chronic heart failure (HF) (3, 4). In addition, BNP has been extensively studied and frequently used not only for HF diagnosis but also for evaluation of risk factors and adverse outcomes in pediatric patients (5-10). However, the utility of BNP as a biomarker in a pediatric intensive care unit (PICU) setting was not extensively evaluated. We aimed to determine the association between initial BNP levels on admission and the need for special interventions such as mechanical ventilation or mechanical circulatory support in patients admitted to PICU for HF. We also assessed the potential association between BNP and mortality. Finally, we compared BNP with other clinical parameters to evaluate the efficacy in predicting the need for special interventions in these patients. In this single-center retrospective study, the medical records of pediatric patients admitted to the PICU of Asan Medical Center Children’s Hospital in Seoul, Republic of Korea between February 2009 and August 2015 were reviewed. Patients whose HF diagnosis was deemed qualifiable for retrospective entry were included in the registry. HF diagnosis was based on conglomerative findings of typical clinical features (such as tachypnea, dyspnea, diaphoresis, feeding difficulty) and radiographic, echocardiographic (whether or not structural or functional abnormality of the heart at rest was observed), and laboratory findings. Patients, whose initial echocardiogram results on admission or required laboratory data were not available, were excluded. Echocardiogram was performed by an attending intensivist or cardiologist immediately after admission to PICU. Left ventricular ejection fraction (LVEF) was obtained using Simpson’s method. HF was classified according to the New York Heart Association HF class for older children, and Ross HF class for younger children. Patient demographics, HF etiology, need for mechanical ventilation or mechanical circulatory support by extracorporeal membrane oxygenation (ECMO), length of PICU stay, heart transplantation status, and mortality data were collected. Laboratory data obtained immediately after PICU admission included BNP, cardiac enzymes such as CK-MB and troponin I as well as lactic acid as readout for systemic circulation were collected. In addition, the highest vasoactive-inotropic score (VIS) and pediatric risk of mortality (PRISM) III score during the first 24 h after PICU admission were collected. VIS was calculated according to the following formula: vasoactive-inotropic score (VIS) = dopamine dose (mcg/kg/min) + dobutamine dose (mcg/kg/min) + 100 × epinephrine dose (mcg/kg/min) + 10 × milrinone dose (mcg/kg/min) + 10,000 × vasopressin dose (units/kg/min) + 100 × norepinephrine dose (mcg/kg/min). Statistical analysis was performed using SPSS software for Windows® version 18 (SPSS, Chicago, IL). Three consecutive comparisons were performed for variables between two groups categorized according to the need for mechanical ventilation, the need for mechanical circulatory support, or survival. Continuous variables were compared using the Wilcoxon rank sum test, expressed as a median [interquartile]. Receiver operating characteristic (ROC) curves were determined to evaluate variables as predictors of the need for special interventions. We performed a receiver operating characteristic (ROC) curve analysis using significant variables from univariable analyses. Optimal cutoff points were determined based on 95% confidence intervals (95% CIs). For all analyses, P values < 0.05 were considered statistically significant. This study was approved by the institutional review board of Asan Medical Center. The IRB confirmed that no ethical approval for such retrospective analysis of anonymous data is necessary. A total of 132 patients were admitted to the PICU for HF during the study period. Of these, 19 patients were excluded from the study due to incomplete data (absent echocardiographic data on day of PICU admission, n = 8; lack of complete cardiac marker results, n = 11). Thus, 113 patients were included in the final analysis (Table 1). Congenital heart disease was the most common cause of HF (61/113, 54.0%), followed by cardiomyopathy (47/113, 41.6%). Majority of the patients (101/113, 89.4%) were classified as class IV HF, and the remaining 12 patients (10.6%) were classified as class III HF. Abbreviations: ECMO, extracorporeal membrane oxygenation; HF, heart failure; PICU, pediatric intensive care unit. Sixty-four (56.6%) patients received mechanical ventilatory support during their PICU stay. Fifty-three out of a total of 64 mechanically-ventilated patients received ventilatory support on the day of PICU admission, and the median time from PICU admission to initiation of ventilatory support was 0 [0, 0.8] days. ECMO was the only mechanical circulatory support modality in 19 (16.8%) patients. Of these, seven patients were supported by ECMO on the day of PICU admission, and the median time from PICU admission to initiation of ECMO was 3 [0, 10] days. Heart transplantation was ultimately needed in 8 patients; 7 of the recipients survived. Overall hospital mortality was 15.0% (Table 1). High PRISM III scores and the highest VIS during the first 24 h after PICU admission as well as elevated levels of lactic acid, BNP, CK-MB, and troponin I were associated with the need for mechanical ventilatory support. High PRISM III score, reduced LVEF, elevated lactic acid, and BNP were associated with the need for ECMO (i.e. mechanical circulatory support). PRISM III score and BNP were the only factors that were associated with mortality (Table 2). Abbreviations: ECMO, extracorporeal membrane oxygenation; PICU, pediatric intensive care unit; PRISM III, Pediatric Risk of Mortality III; VIS, vasoactive-inotropic score. a Results are presented as median [interquartile]. Receiver operating characteristic (ROC) curves incorporating the significant variables from univariate analyses were generated to determine factors associated with the need for mechanical ventilatory support. As seen in Figure 1A, the areas under the curve (AUCs) for BNP and PRISM III score were 0.774 and 0.740 respectively. Conversely, ROC analysis for identification of factors associated with ECMO use revealed that the AUCs for BNP and LVEF were 0.756 and 0.758 respectively (Figure 1B). The sensitivity, specificity, positive predictive value (PPV), and negative predictive value (NPV) of BNP with a cutoff value set at 1848 pg/mL were 75.4%, 72.7%, 76.8%, and 70.5% for the need for mechanical ventilation and 89.5%, 50.0%, 89.5%, and 47.9% for the need for ECMO, respectively (Table 3). Figure 1. Receiver operating characteristic curve analysis to determine the associations between mechanical ventilation use and clinical parameters. Abbreviations: BNP, brain natriuretic peptide; CI, confidence interval; PRISM III, Pediatric Risk of Mortality III; VIS, vasoactive- inotropic score. Figure 2. Receiver operating characteristic curve analysis to determine the associations between extracorporeal membrane oxygenation use and clinical parameters. Abbreviations: BNP, brain natriuretic peptide; CI, confidence interval; LVEF, left ventricular ejection fraction; PRISM III, Pediatric Risk of Mortality III. Abbreviations: ECMO, extracorporeal membrane oxygenation; PPV, positive predictive value; NPV, negative predictive value. In this single-center retrospective study, we found that BNP levels on PICU admission were associated with mechanical ventilatory and circulatory support in pediatric patients admitted to PICU for HF. Initial BNP level was at least similar or superior to other parameters evaluated by ROC curve analysis in this study, providing evidence for heart function and/or disease severity as predictors of the need for mechanical ventilatory and circulatory support. Additionally, initial BNP was significantly associated with hospital mortality. Similar to these findings showing an association between BNP and mechanical ventilatory support, Vander Werf et al. (11) previously demonstrated that the change in plasma BNP during the first 24 h after admission to ICU due to traumatic injury was a predictor of the need for mechanical ventilation. HF is affected by a shift in intrathoracic pressure from positive to negative, which sequentially leads to increased catecholamine release and increased cardiac preload and afterload (12). The intrathoracic pressure simply increases and is freed from negative swings during mechanical ventilatory support, which further improves cardiac function during HF. Thus, mechanical ventilation can be used to alleviate the severity of HF, and our findings suggest that BNP may be used for identification of severe HF cases that may benefit from mechanical ventilatory support. In our study, 52 out of 69 patients received mechanical ventilatory support within the first 24 h of PICU admission. Thus, we assessed only the initial BNP levels on admission unlike the study by Vander Werf et al. (11) that analyzed changes in BNP levels during the first 24 h of admission. We found that initial BNP level might have a prognostic value in identifying patients that require mechanical ventilatory support during the first day of PICU stay. We compared initial serum BNP level with several parameters reflecting heart function or disease severity. Lactic acid was one of the parameters tested, as hyperlactatemia was recently demonstrated to associate with poor prognosis including mortality in patients undergoing cardiac surgery (13, 14). In the present study, lactic acid was associated with the need for mechanical ventilatory/circulatory support; however, the predictive value of BNP was superior to that of lactic acid. These findings were consistent with findings reported by Amirnovin et al. (15). They showed that BNP was significantly associated with adverse outcomes when compared with other clinical parameters such as vital signs monitored at bedside and lactic acid. Additionally, only BNP showed a significant association with mortality, whereas lactic acid did not exhibit such an association in HF patients included in the present study. According to a study by Curtis et al. LEVF had a negative linear correlation with mortality in HF patients (16). In contrast, LVEF on admission was associated with mechanical circulatory support but not with mortality in the current study. The disparity between the two studies might be due to difference in the follow-up periods to determine mortality rates: The follow-up was 37 months in the study by Curtis and colleagues, whereas we only determined in-hospital mortality. Additionally, Curtis et al. found that the correlative changes in mortality and LVEF were limited to only when LVEF was less than 45%. The mean LVEF values of survivors and non-survivors in this study were 44% and 41%; neither was dramatically decreased, which may have contributed to the minimal effect of LVEF on mortality. The pattern of association between ECMO use and LVEF was similar to its association with BNP. BNP was previously shown to be a reliable marker in diagnosing HF and is widely recommended for clinical use (17, 18). Furthermore, BNP was shown to be a strong predictor of cardiac dysfunction in ICU settings (19), and a positive linear relationship between BNP on admission and in-hospital mortality was demonstrated (20). In the current study conducted in a PICU setting, we aimed to verify the clinical utility of BNP on admission in assessment and prediction of clinical outcomes such as the need for mechanical ventilator/circulatory support. Our study has several limitations. First, this was a retrospective study conducted at a single medical center. Second, there were no established protocols to determine the use of invasive mechanical ventilatory support. Recent guidelines recommend invasive mechanical ventilatory support in acute HF patients only after the failure of noninvasive methods such as continuous positive airway pressure or noninvasive positive pressure ventilation (21). Thus, it remains unclear whether all patients included in the current study actually required mechanical ventilation. Eight of the patients received noninvasive ventilatory support prior to invasive mechanical ventilatory support, all of whom failed to show improvement of symptoms including labored respiration and diaphoresis; all patients were subsequently intubated. Additionally, eight patients were administered O2 by high-flow nasal cannula or nasal mask. Nasal cannulae were associated with intranasal mucosal bleeding and obstruction, precipitating labored breathing (22, 23), whereas nasal masks were associated with decreased O2 delivery due to the opening of the mouth (24, 25). Therefore, these noninvasive ventilatory support measures might have failed to provide efficient respiratory support, leading to the need for invasive ventilatory support. Additionally, the hospital mortality rate, which reached 50% in adult patients requiring intubation (26), was 18.8% (13/69) in this study. Future studies are needed to determine whether noninvasive ventilation as first-line therapy in pediatric HF patients is efficient. Mechanical ventilation aids in alleviation of HF, and mechanical circulatory support was recently recognized as more than a supportive modality for the treatment of pediatric HF patients who are either compromised or nonresponsive to pharmacological treatment. BNP is emerging as a promising marker for predicting the critical need for mechanical ventilatory/circulatory support in patients with HF. Large-scale multicenter studies are needed to validate our findings demonstrating the utility of BNP on admission to PICU in HF patients. Further studies are warranted to determine whether BNP levels can be incorporated into the clinical decision making including the determination of the mode of respiratory support (i.e., invasive or noninvasive), following the establishment of standardized protocols of mechanical ventilatory support for pediatric HF patients. In conclusion, BNP, in addition to its utility in HF diagnosis, was also shown to be a predictor of prognosis in pediatric HF patients. BNP levels on admission to ICU were associated with the need for mechanical ventilatory/circulatory support as well as hospital mortality. The predictive value of BNP on admission was at least similar or superior to other clinical parameters predicting disease severity. Authors' Contribution: Seung Jun Choi designed the study, carried out statistical analyses, interpreted data, and wrote the draft and final version of the manuscript. Eun-Ju Ha collected data. Won Kyoung Jhang critically revised the manuscript. Seong Jong Park supervised the whole process, critically revised the manuscript, and approved the final version. 1. Chen HH, Burnett JC. Natriuretic peptides in the pathophysiology of congestive heart failure. Curr Cardiol Rep. 2000;2(3):198-205. [PubMed: 10980893]. 2. Tsutamoto T, Wada A, Maeda K, Hisanaga T, Maeda Y, Fukai D, et al. Attenuation of compensation of endogenous cardiac natriuretic peptide system in chronic heart failure: prognostic role of plasma brain natriuretic peptide concentration in patients with chronic symptomatic left ventricular dysfunction. Circulation. 1997;96(2):509-16. [PubMed: 9244219]. 3. Maisel AS, Krishnaswamy P, Nowak RM, McCord J, Hollander JE, Duc P, et al. Rapid measurement of B-type natriuretic peptide in the emergency diagnosis of heart failure. N Engl J Med. 2002;347(3):161-7. doi: 10.1056/NEJMoa020233. [PubMed: 12124404]. 4. McCullough PA, Nowak RM, McCord J, Hollander JE, Herrmann HC, Steg PG, et al. B-type natriuretic peptide and clinical judgment in emergency diagnosis of heart failure: analysis from Breathing Not Properly (BNP) Multinational Study. Circulation. 2002;106(4):416-22. [PubMed: 12135939]. 5. Auerbach SR, Richmond ME, Lamour JM, Blume ED, Addonizio LJ, Shaddy RE, et al. BNP levels predict outcome in pediatric heart failure patients: post hoc analysis of the Pediatric Carvedilol Trial. Circ Heart Fail. 2010;3(5):606-11. doi: 10.1161/CIRCHEARTFAILURE.109.906875. [PubMed: 20573993]. 6. Das BB. Plasma B-type natriuretic peptides in children with cardiovascular diseases. Pediatr Cardiol. 2010;31(8):1135-45. doi: 10.1007/s00246-010-9758-x. [PubMed: 20927510]. 7. Law YM, Hoyer AW, Reller MD, Silberbach M. Accuracy of plasma B-type natriuretic peptide to diagnose significant cardiovascular disease in children: the Better Not Pout Children! Study. J Am Coll Cardiol. 2009;54(15):1467-75. doi: 10.1016/j.jacc.2009.06.020. [PubMed: 19796740]. 8. Sahin M, Portakal O, Karagoz T, Hascelik G, Ozkutlu S. Diagnostic performance of BNP and NT-ProBNP measurements in children with heart failure based on congenital heart defects and cardiomyopathies. Clin Biochem. 2010;43(16-17):1278-81. doi: 10.1016/j.clinbiochem.2010.08.002. [PubMed: 20709045]. 9. Cantinotti M, Clerico A, Murzi M, Vittorini S, Emdin M. Clinical relevance of measurement of brain natriuretic peptide and N-terminal pro-brain natriuretic peptide in pediatric cardiology. Clin Chim Acta. 2008;390(1-2):12-22. doi: 10.1016/j.cca.2007.12.020. [PubMed: 18230356]. 10. Koulouri S, Acherman RJ, Wong PC, Chan LS, Lewis AB. Utility of B-type natriuretic peptide in differentiating congestive heart failure from lung disease in pediatric patients with respiratory distress. Pediatr Cardiol. 2004;25(4):341-6. doi: 10.1007/s00246-003-0578-0. [PubMed: 15054559]. 11. Vander Werf BD, Watt J, Joseph B, Wynne J, Kulvatunyou N, O'Keeffe T, et al. Can plasma B-type natriuretic peptide levels predict need for mechanical ventilation after injury? Am J Surg. 2010;200(6):845-50. discussion 850. doi: 10.1016/j.amjsurg.2010.07.038. [PubMed: 21146031]. 12. Lemaire F, Teboul JL, Cinotti L, Giotto G, Abrouk F, Steg G, et al. Acute left ventricular dysfunction during unsuccessful weaning from mechanical ventilation. Anesthesiology. 1988;69(2):171-9. [PubMed: 3044189]. 13. Toraman F, Evrenkaya S, Yuce M, Aksoy N, Karabulut H, Bozkulak Y, et al. Lactic acidosis after cardiac surgery is associated with adverse outcome. Heart Surg Forum. 2004;7(2):E155-9. doi: 10.1532/HSF98.20041002. [PubMed: 15138095]. 14. Davies AR, Bellomo R, Raman JS, Gutteridge GA, Buxton BF. High lactate predicts the failure of intraaortic balloon pumping after cardiac surgery. Ann Thorac Surg. 2001;71(5):1415-20. [PubMed: 11383775]. 15. Amirnovin R, Keller RL, Herrera C, Hsu JH, Datar S, Karl TR, et al. 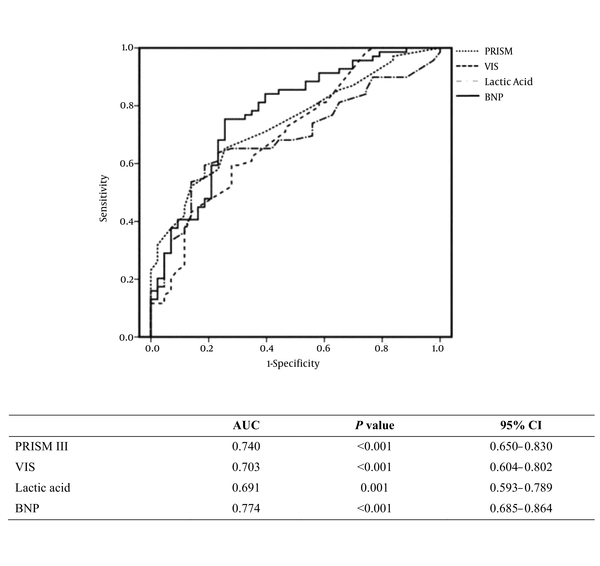 B-type natriuretic peptide levels predict outcomes in infants undergoing cardiac surgery in a lesion-dependent fashion. J Thorac Cardiovasc Surg. 2013;145(5):1279-87. doi: 10.1016/j.jtcvs.2012.07.067. [PubMed: 22914252]. 16. Curtis JP, Sokol SI, Wang Y, Rathore SS, Ko DT, Jadbabaie F, et al. The association of left ventricular ejection fraction, mortality, and cause of death in stable outpatients with heart failure. J Am Coll Cardiol. 2003;42(4):736-42. [PubMed: 12932612]. 17. McMurray JJ, Adamopoulos S, Anker SD, Auricchio A, Bohm M, Dickstein K, et al. ESC Guidelines for the diagnosis and treatment of acute and chronic heart failure 2012: The Task Force for the Diagnosis and Treatment of Acute and Chronic Heart Failure 2012 of the European Society of Cardiology. Developed in collaboration with the Heart Failure Association (HFA) of the ESC. Eur Heart J. 2012;33(14):1787-847. doi: 10.1093/eurheartj/ehs104. [PubMed: 22611136]. 18. Lindenfeld J, Albert NM, Boehmer JP, Collins SP, Ezekowitz JA; Heart Failure Society of America, et al. HFSA 2010 Comprehensive Heart Failure Practice Guideline. J Card Fail. 2010;16(6):e1-194. doi: 10.1016/j.cardfail.2010.04.004. [PubMed: 20610207]. 19. McLean AS, Tang B, Nalos M, Huang SJ, Stewart DE. Increased B-type natriuretic peptide (BNP) level is a strong predictor for cardiac dysfunction in intensive care unit patients. Anaesth Intensive Care. 2003;31(1):21-7. [PubMed: 12635390]. 20. Fonarow GC, Peacock WF, Phillips CO, Givertz MM, Lopatin M; Adhere Scientific Advisory Committee, et al. Admission B-type natriuretic peptide levels and in-hospital mortality in acute decompensated heart failure. J Am Coll Cardiol. 2007;49(19):1943-50. doi: 10.1016/j.jacc.2007.02.037. [PubMed: 17498579]. 21. Nieminen MS, Bohm M, Cowie MR, Drexler H, Filippatos GS, Jondeau G, et al. Executive summary of the guidelines on the diagnosis and treatment of acute heart failure: the Task Force on Acute Heart Failure of the European Society of Cardiology. Eur Heart J. 2005;26(4):384-416. doi: 10.1093/eurheartj/ehi044. [PubMed: 15681577]. 22. Goldman SL, Brady JP, Dumpit FM. Increased work of breathing associated with nasal prongs. Pediatrics. 1979;64(2):160-4. [PubMed: 38429]. 23. Locke RG, Wolfson MR, Shaffer TH, Rubenstein SD, Greenspan JS. Inadvertent administration of positive end-distending pressure during nasal cannula flow. Pediatrics. 1993;91(1):135-8. [PubMed: 8416477]. 24. Padman R, Lawless ST, Kettrick RG. Noninvasive ventilation via bilevel positive airway pressure support in pediatric practice. Crit Care Med. 1998;26(1):169-73. [PubMed: 9428561]. 25. Fortenberry JD, Del Toro J, Jefferson LS, Evey L, Haase D. Management of pediatric acute hypoxemic respiratory insufficiency with bilevel positive pressure (BiPAP) nasal mask ventilation. Chest. 1995;108(4):1059-64. [PubMed: 7555120]. 26. Nava S, Carbone G, DiBattista N, Bellone A, Baiardi P, Cosentini R, et al. Noninvasive ventilation in cardiogenic pulmonary edema: a multicenter randomized trial. Am J Respir Crit Care Med. 2003;168(12):1432-7. doi: 10.1164/rccm.200211-1270OC. [PubMed: 12958051].